“Romantic things to do in Tuscany”–even that phrase sounds like a honeymoon waiting to happen. Tuscany is one of our favorite places in the world to travel as a couple, and a combined two months of traveling there later, our Tuscany bucket list is actually longer than when we first got there! We love going in detail with guides to specific Tuscan destinations like Florence and Arezzo–but this post isn’t going to be about that. 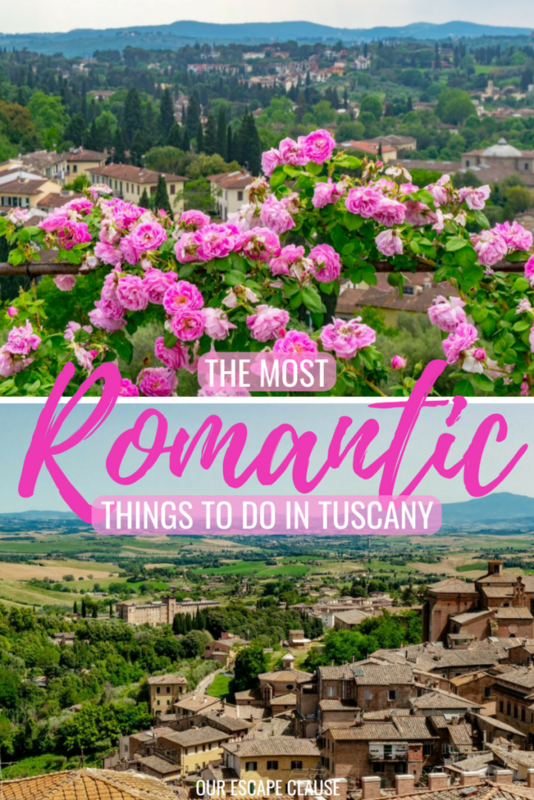 This list of romantic things to do in Tuscany is more about the region as a whole: its landscape, its nature, its villages, and all. Though I could easily and happily list out a hundred town-specific romantic things to do in Tuscany (like wandering the Uffizi together in Florence, for example), I’m going to stay away from that as much as possible (one or two iconic exceptions aside). That being said–here are the most romantic things to do in Tuscany. Ride a Vespa through the countryside. We partnered with Walkabout Florence to ride our first-ever Vespa: Jeremy did the bulk of the driving, and I was quite happy to ride on the back. After finishing our day, we easily consider a Vespa ride to be one of the most romantic things to do in Tuscany. The weather was perfect the day we set out–around 75 degrees and sunny–and before long, we were leaving our starting point of Florence behind and climbing high into the hills of Tuscany, winding our way past epic views of the city, through tiny towns with stone houses, and among vineyards. Our tour included three stops–one at a beautiful church with panoramic views of Florence, one at a vineyard to admire the views, and one for lunch (including wine, of course) at a picturesque Tuscan farmhouse–and while all three were memorable and beautiful in their own right, it was hard to top the romance of riding a Vespa together through the beautiful countryside. Take a food tour (or six). As one of the best foodie destinations in the world, no list of things to do in Tuscany would be complete without mentioning a food tour! Indulge in the best of what Tuscany has to offer, learn your way around the food scene, and get prepared for an entire trip worth of delicious food. We always recommend taking a food tour toward the beginning of your Tuscany trip, rather than the end–that way you’ll have a list of favorite dishes to order for the rest of your time in the region! We loved this evening food tour of the Oltrarno area in Florence! The food was delicious, the guide excellent, and we learend quite a bit about Tuscan food! Enjoy the views from Tuscany’s hilltop towns. 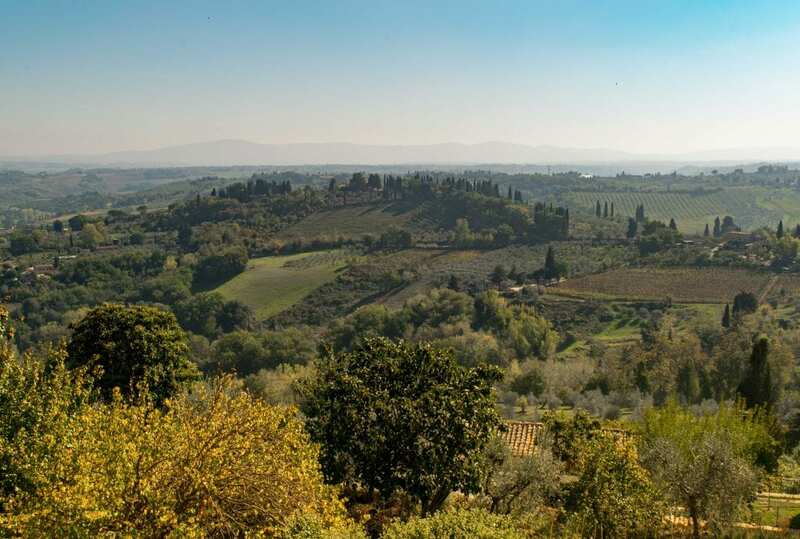 Whether you’re visiting Volterra, San Gimignano, Siena, or beyond, staring out over the views of the rolling Tuscan countryside (perhaps with a nice lunch and a glass of wine?) with your partner deserves to be on any list of the most romantic things to do in Tuscany. Take a road trip through the Val d’Orcia. There are tons of amazing places for road trips in Tuscany (read: basically anywhere that isn’t a major city like Florence or a walled old town), but none are quite as impeccable as the Val d’Orcia. 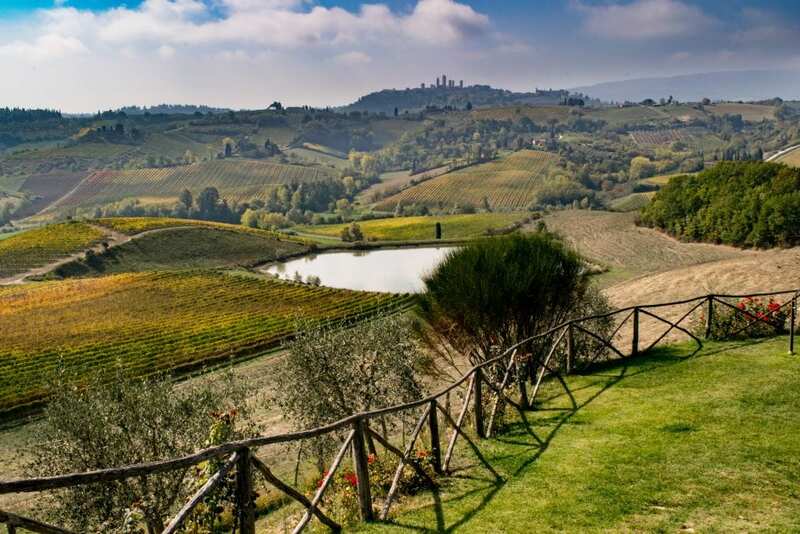 If you’ve seen pictures of Tuscany, you’ve probably seen the Val d’Orcia: it’s the Tuscany of everything from Renaissance paintings to modern photography, and it is the perfect place to hit the open road with your partner. 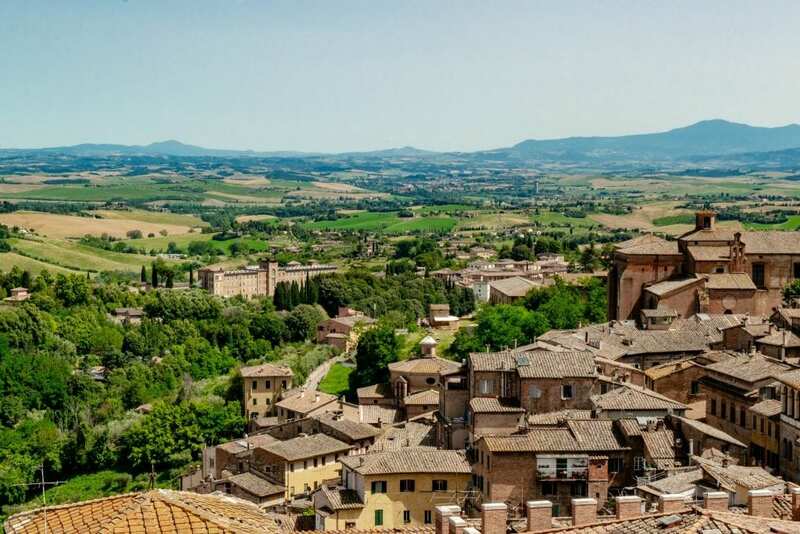 You might want to consider indulging in a fun Italian car rental for your trip–perhaps a Fiat 500, or for the luxury seekers among us, even a Ferrari–and definitely make sure to read up on driving in Tuscany before you get started! Indulge in some beach time. Tuscany’s wine country, olive groves, food scene, hilltop towns, and famous cities like Florence tend to get all the press (and it’s not hard to see why–they’re amazing! 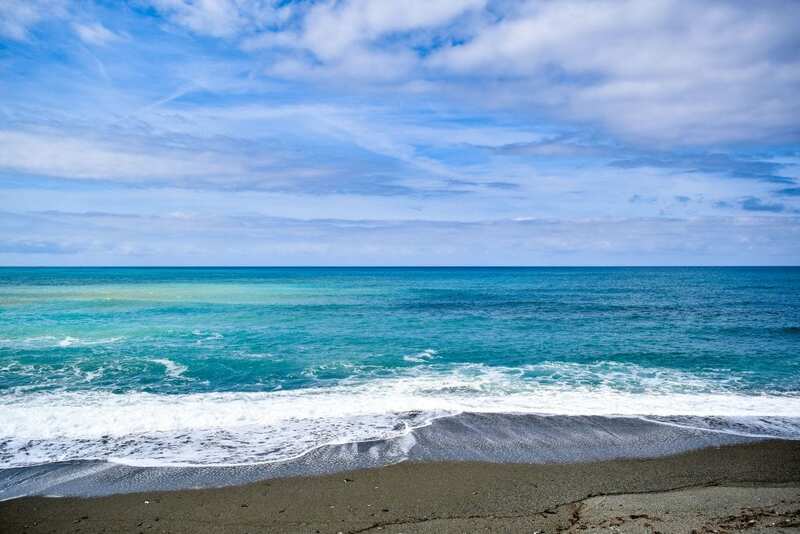 ), so it can sometimes be hard to remember that Tuscany is home to its own sizable stretch of Mediterranean coastline–and even an island! The island of Elba is a great place to chill out on a Tuscan beach, go sailing or scuba diving, eat delicious seafood, and learn a bit of history–this is the island Napoleon was originally exiled to (though he did escape back to France about 300 days later). Did you know that Tuscany is home to several natural hot springs–and that many of them are free to visit? The best known hot spring is Saturnia, and it can be incredibly romantic to relax in nature with your loved one, perhaps with a glass of local wine! There is one decidedly unromantic thing about the hot springs that bears mentioning, though: the sulfur smell is strong! Bring old bathing suits that you don’t mind getting stinky (and ideally, ones you’re ready to part with when you’re done). Still worth a visit, though! Go horseback riding through Tuscan vineyards. The long rows of grapes, the sound of the horses feet on the farm, and endless countryside visible in all directions–what could be more romantic than a couple’s horseback ride in Tuscany? We were invited out by Fun in Tuscany to have an incredible day in Tuscany including a wine tasting with a meal, a visit to San Gimignano, and, of course… horseback riding. Jeremy and I love to go horseback riding together (we’ve ridden together in six countries so far! ), and it’s hard to imagine a more romantic place for it than Tuscany. We started our day with Fun in Tuscany by riding through never-ending vineyards, soaking in the sweeping views and beautiful villas that we passed along the way. Our group was tiny–just us, one other person, a guide, and an adorable farm dog name Pepe (“pepper” in Italian) who followed along with us whenever he didn’t get distracted and dart into the woods for a moment or two. It was a very peaceful morning, and our time horseback riding was the perfect start to a fabulous day. Don’t visit Tuscany without travel insurance! We use and recommend World Nomads for their affordability, ease of purchasing & the clarity of their contract! Say hello to the Leaning Tower of Pisa. I’ll be honest–the Leaning Tower of Pisa is a bit of a letdown. Sure, the tower itself is intricate and beautiful, but the city doesn’t have much to do away from the tower area and the crowds are ridiculously heavy. But, there’s no denying that it is one of the most iconic things to do in Tuscany, so feel free to head out for a couple of adorable photos in front of one of the most famous towers in the world. Don’t waste any of your romantic time in Tuscany battling the crowds. Book your skip-the-line tickets to the Leaning Tower of Pisa now! Explore Florence, the capital of Tuscany. 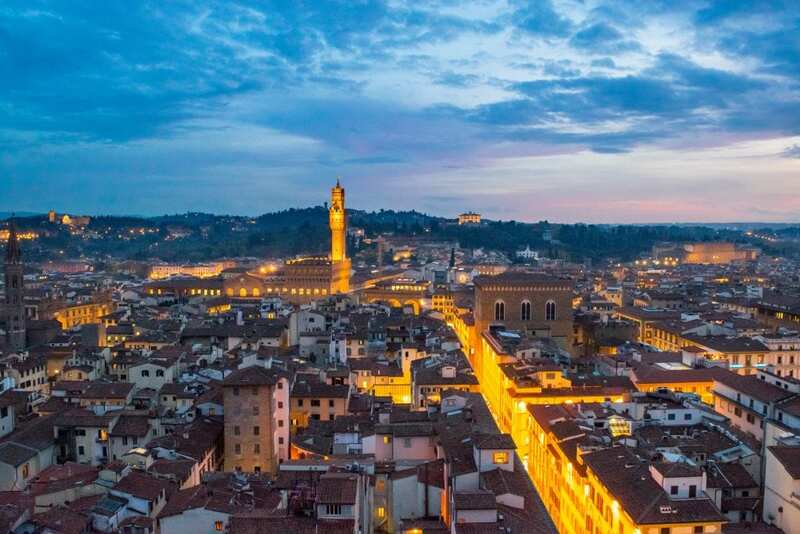 Florence belongs on any list of the world’s most romantic cities. It is absolutely beautiful, home to world-class art, stunning architecture, and some of the world’s best food. Every other spot in Florence, from the Piazza della Repubblica to the Ponte Vecchio to the Piazzale Michelangelo, looks like the background to an epic proposal (just maybe opt for a very early morning proposal before the crowds arrive). 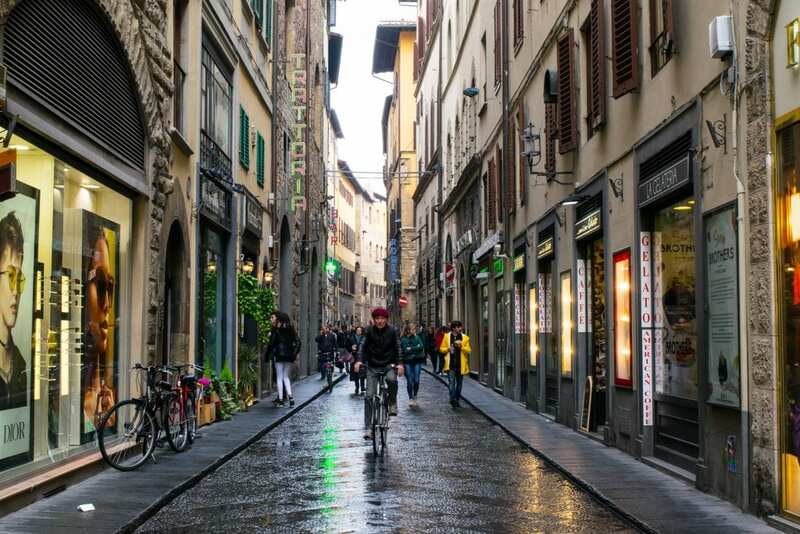 Of all the romantic things to do in Tuscany, wandering the back streets of Florence, ducking into shops and churches and piazzas and trattorias, listening to buskers, and admiring the bustle of the city life, is among our favorites. Teamwork, wine, and delicious food: what could be more romantic than that? Pizza, pasta, sauce, tiramisu, gelato… there’s a Tuscan cooking class for every taste, though we believe the best ones are those that cover a whole day’s worth of eating! We adored our cooking class in the Tuscan countryside and were both ridiculously relaxed and ridiculously full by the time we left. This is the cooking class we took in Florence, and we can’t recommend it enough! Among the more unique things to do in Tuscany is truffle hunting: you, your partner, a dog, and the forest on a quest to find truffles–what a perfect way to spend an afternoon in Tuscany! Truffles are not only delicious and expensive, they can’t be farmed. They merely grow of their own free will, and you can set off to find them hand-in-hand with your partner–and of course, the best way to follow up a truffle hunt is with a romantic truffle-themed meal! Book an unforgettable truffle hunting experience in Tuscany! Indulge in a wine tasting (or three). 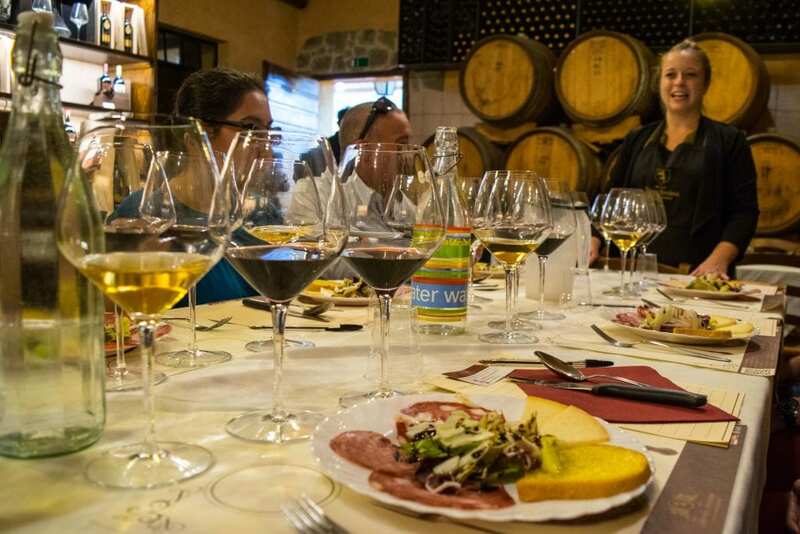 Tuscany is all about the wine, and at least once when there, be sure to sit down with your partner and enjoy the experience of learning more about Tuscan wines–all while indulging in them, of course! While you can certainly find plenty of places to go wine tasting in Tuscan towns and cities, there’s nothing quite like the romance of heading out for a wine tasting at a vineyard. We loved tasting eight different wines at Tenuta Torciano as part of our day spent with Fun in Tuscany–and the meal served with the wine made it even better. Salami, bread, cheeses, balsamic vinegar, homemade lasagna with truffle sauce, cantucci cookies… I’m getting hungry even remembering it! Before and after the meal we had a chance to wander around parts of the gorgeous vineyard property, enjoying each other’s company and taking in views of vines and gazebos, and meeting several friendly chickens and one adorable basset hound. Tuscany is dotted with castles dating back to the Middle Ages and Renaissance, and any romantic trip to Tuscany should include at least a couple of fairytale stops! 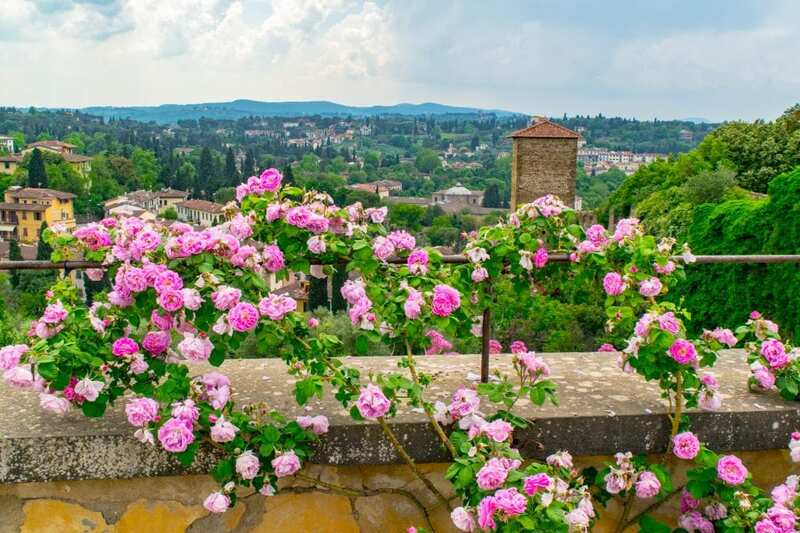 A few castles to consider adding to your list: Castello di Vincigliata in Fiesole (easily accessible from Florence), Castello Banfi in Montalcino (near Siena), and Castello di Vicchiomaggio in Greve (located in the heart of the Chianti wine region). Take a hike in the Apuan Alps. Mountains and Tuscany may not sound like two things to go together–but they do! Tuscany is full of outdoor hiking opportunities, and if your idea of romance is time spent together outdoors, the Apuan Alps are the Tuscan destination for you. Indulge in an olive oil tasting. 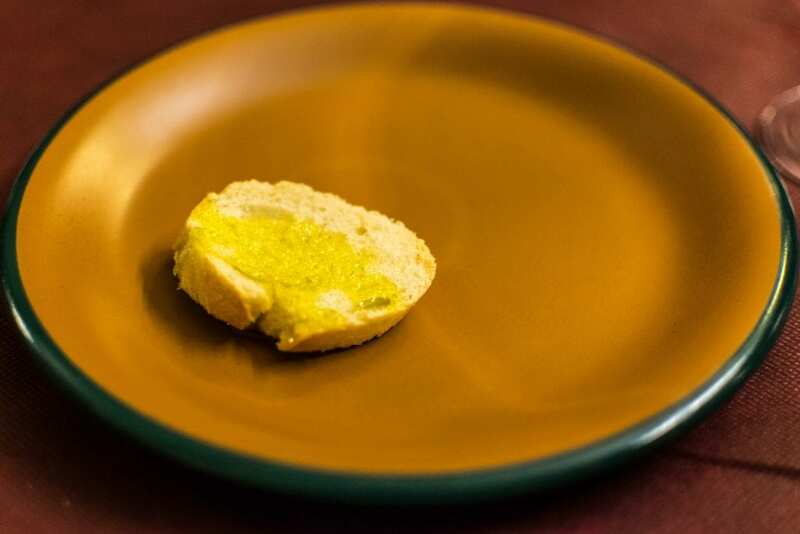 Oh, olive oil: as one of the most iconic foods in Tuscany, an olive oil tasting belongs right alongside food tours and wine tastings on any list of things to do in Tuscany. If you and your partner have never had true Tuscan olive oil before, you’re in for a treat (hint: it tastes nothing like what you get in the grocery store). Tuscany is full of surprises–surprises like Orrido di Botri, the canyon near Lucca that allows you to hike through the river and admire the landscape (during the summer when the water is low, anyway). Get your adventurous sides pumping on your romantic trip to Tuscany! Soar above the vineyards in a hot air balloon. What better way to admire the rolling hills of the Tuscan countryside than from above? Surprise your loved one with an experience you’ll never forget–add riding in a hot air balloon to your list of romantic things to do in Tuscany. Stay at a Tuscan farmhouse. Tuscany’s cities and towns are absolutely divine, but if you’re looking for a little isolation on your romantic trip to Tuscany, consider renting a Tuscan farmhouse! You can even look for one that’s still on the property of a functioning vineyard or olive farm to create the perfect atmosphere for a Tuscan getaway for two. Watch the sunset over Tuscany. Tuscany is world-renowned for its golden light that clings to the landscape, and it’s never more magical than when the sun sets. Grab a glass of wine and the hand of your beloved and settle in for Tuscany’s best natural show each night–whether you’re watching from the Piazzale Michelangelo in Florence or the porch of a remote Tuscan farmhouse, there’s no doubt that watching the sunset is one of the simplest ways to enjoy romance in Tuscany. Tuscany is the perfect place to be aimless: whether it’s wandering the cobblestone streets of Florence, choosing a random small town on a map and hopping on a train to visit it, or ducking into small churches and out-of-the-way museums because you happen to be passing by, Tuscany is ideal for meandering with a loved one. This is the kind of place where the word savor comes to mind: savor the views, the food, the wine, the time with your partner… nothing can be rushed in Tuscany, and that’s the beauty of it. Trains are our favorite way to travel around Tuscany–they’re plentiful, they’re easy to use, they’re affordable, and they are (in our biased opinion) one of the most romantic ways to travel. For most of these romantic things to do in Tuscany, a train is all you need! 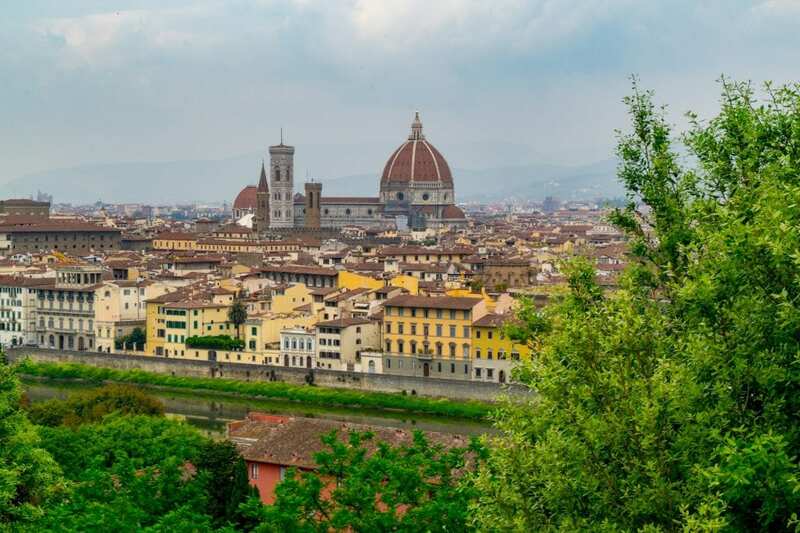 Consider basing yourselves in Florence, Siena, or perhaps Lucca to ensure you have plenty of routes and connections to allow you to explore Tuscany to the fullest. For a few of these things, though–namely hiking, enjoying the hot springs, and visiting the canyon, you’ll want to have a car to get around. Not a problem, since as listed above, a Tuscan road trip definitely qualifies as something romantic to do in Tuscany! If you do choose to rent a car, keep in mind that Italy requires you to have an International Driving Permit, which you’ll need to obtain before your trip, to rent a car in the country. Many thanks to Walkabout Florence for hosting us on our cooking class and our Vespa tour in the Tuscan countryside, Fun in Tuscany for hosting us on a day out that included horseback riding, wine tasting, and a visit to San Gimignano, and Walks of Italy for hosting us on the Dine Around Florence food tour. All opinions are, as always, our own. Tuscany should definitely get more attention than what it gets now. Of all the activities listed by you visiting the small villages appeal the most to me. I think small towns and villages are where the true soul of a country can be experienced. There’s nothing like small Italian towns! They are definitely something special. 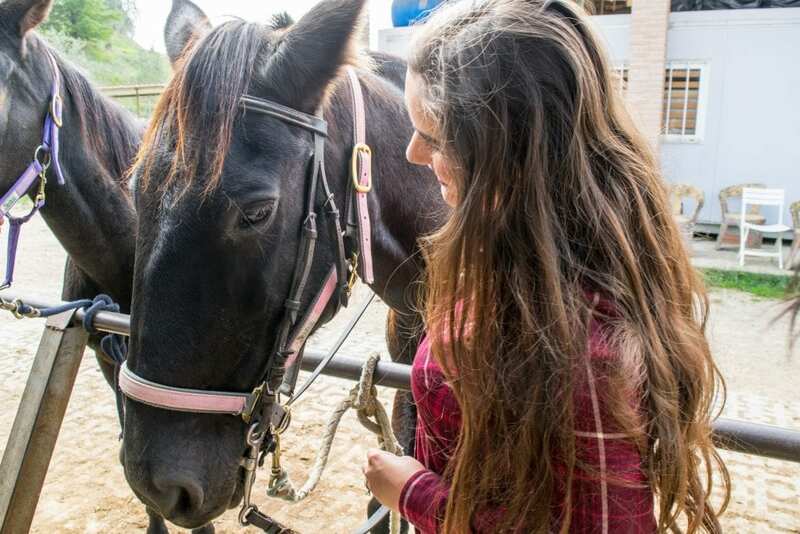 Horseback riding through the Tuscan streets is very romantic! I love Tuscany and it’s great you found a better spot to watch the sunset in Firenze! Who can say no to some Tusacn wine tasting? Not me, that’s for sure! Haha, us either! Definitely an experience worth having. Believe it or not, we STILL haven’t seen or read Under the Tuscan Sun. Need to fix that! Riding a Vespa through the hills of Tuscany really is a dream come true. I can only imagine how much fun you newlyweds (yes, you can still call yourself that!) had together- what a beautiful place to share time together. It was definitely one of our most memorable moments of the month–having perfect weather for it was the cherry on top! I was not knowing that Tuscany is so romantic. Strolling along Arno river, typical scooter ride and visiting vineyards looks very dreamy. I went to Florence but missed Tuscan countrysides and now I am regretting after reading your post. All the more reason to go back! There’s no such thing as too many trips to Florence. Oh my! Tuscany truly seems to romantic – how I would love to experience riding a vespa through the countryside….and wow watching the sunset over Florence, that’s a proposal waiting to be had! And wine tasting sounds absolutely delectable! Italian wine is amazing, so I am sure visiting the wineries in this region would be such a beautiful experience. Definitely the perfect place for a proposal! Tuscany is one of the most romantic places we’ve ever been for sure. 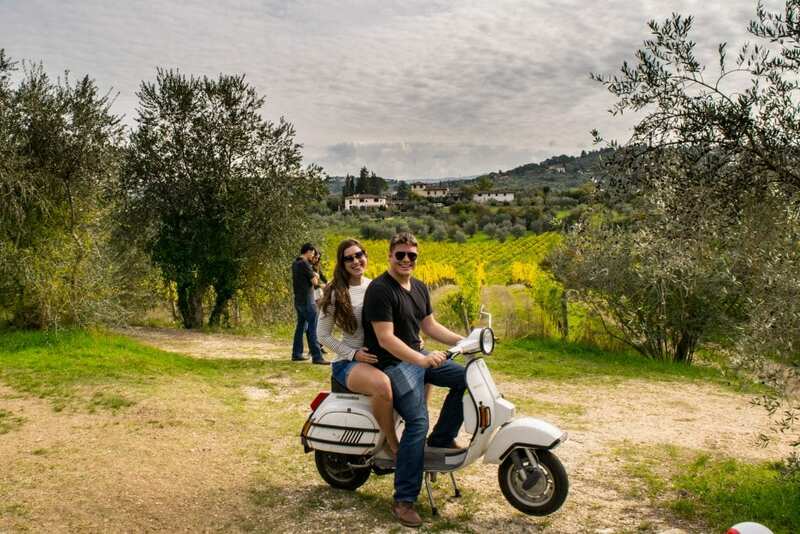 I agree, the Vespa ride is unforgettable–and Italy is the perfect romantic destination! Easy to see why it’s at the top of so many honeymoon lists. I’m in Florence now and was really looking forward to getting that reflection shot of Ponte Veccio. It’s been raining a lot though so there is no reflection, I’m so jealous of your Instagram shot! The sunset you witnessed from the bell tower sounds very romantic. Ohh, I hope you get it! At night they light it up a little bit to help the reflections along–if you have a tripod and a dry night, you might try that! Tuscany is my favourite region in Italy, and you’ve really captured the romance and beauty! I love the food especially and the wine here is exquisite. I think my favourite thing that you’ve mentioned is the art in Florence. You can’t help but fall in love with it. The art definitely is amazing! We loved walking around and soaking it all in. Thanks for this great article! Florence is just a romantic city indeed. I am glad you mentioned the art, I believe this is what makes this city so special. You can take art history courses in Florence even if you are there for a short stay, I think it could also be something romantic to do with your partner! Thanks again for sharing your tips with us! It definitely would be! I hear there are drawing and art classes too, which would also be great. Jeremy and I are terrible artists, but we may still consider trying our hand at one of those!